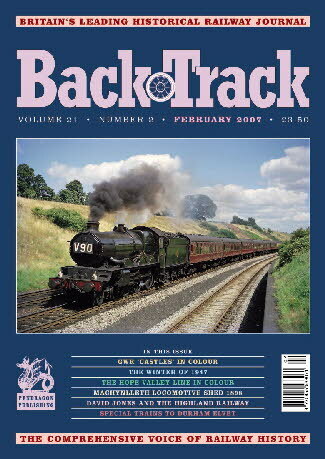 Railway Magazine | BackTrack Feb 2007 journal from Pendragon Publishing. Along the Hope Valley line - colour photographs by Alan Tyson of the Midland Railway's Chinley to Dore & Totley route. Day Return to Warrenpoint - Joe Magill relives a memorable day out from Belfast in 1956. A view from Walnut Tree Viaduct - Hugh Ballantyne's colour photographs of the Barry Railway viaduct over the Taff Vale. Machynlleth Locomotive Shed 1898 - John Reohorn writes about locomotive working on the Cambrian Railways at the end of the 19th century. Cherwell Valley Signalling - Old and new signalling systems between Oxford and Banbury described by Graham Elgar. Snow White - dramatic colour photos of steam in winter. 1970s Lincoln - b/w photos by Andy Sparks taken in August 1979. An Englishman's 'Castles' - a colour feature on the GWR 'Castles' by Derek Penney. David Jones of the Highland Railway - Michael Rutherford looks at myths and facts surrounding this HR locomotive engineer. Special Trains to Durham Elvet - Arthur Chadwick describes a range of special occasions: locomotive exhibitions, circus trains and the famous Durham Miners' Galas. Diesel and Electric Prototypes and Demonstators - colour feature on potential trail-blazers from the motive power transitional years. The Bleak Midwinter 60 Years On - A.J. Mullay tells the railways' story from the bitter winter of 1947. Passenger Train Motive Power over the Mendips - J. Crosse provides an insight into the efforts to keep Somerset & Dorset holiday expresses on the move.